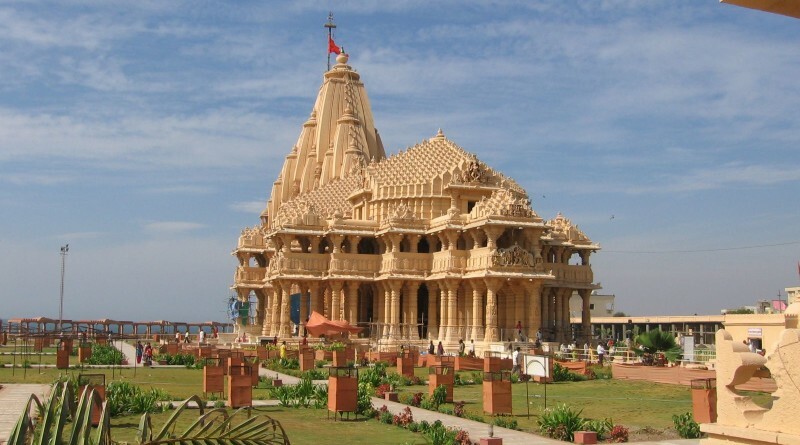 Somnath temple is located in the historic Saurashtra (Gujarat) Kathiawar region Prabhas Patan. The country’s 12 Jyothirlingams famous Somnath Jyotirlinga (Somnath Jyotirlinga in Gujrat) is at first place. Chanting Mahmritunjaya mantra in Somnath temple destroys all sins.There is a holy pool in the Somnath temple. According to the Mythological tale, taking bath in the pool cures the incurable diseases. Temple Opening Time 6:00 AM and Closing Time 9:00 PM. Aarti(Pray) three times in a day. At 7:00 AM, 12:00 PM and 7:00 PM. According to ancient hindu texts, the lord Chandera was married to twenty seven daughters of King Daksha but lord Chandera loved most with Rohini. Due to this all wifes were not happy with lord Chandera. They all went to King Daksha and told her story. King Daksha was so angry and he cursed lord Chandera. The lord Chandera was deviate and start lord shiva pray. To avoid the curse of the gods lord Brahma with the lord Chandera go Prabhas area and there ritually start chant Mahmritunjaya to the worship of lord Shiva. If you were pleased with his penance Bholenath will free them from the curse. Hence at Prabhasa, Lord Shiva came to be known as Somanath, the Lord of the Chandera.